The Burj Dubai tower is located in the the Downtown Burj Dubai development by Emaar Properties. The skyscraper was renamed as Burj Khalifa, after the President of the UAE, at the opening ceremony on 04 January 2010. Height of the Burj Khalifa was revealed as 828m, and it is the tallest building in the world as of the opening date. The Burj Dubai (Arabic for "Dubai Tower" but you might have a good chance of fooling newbies to Dubai that it means "don't look down") is a mixed use tower with commercial and residential areas, under construction in the Downtown Burj Dubai development, with an official opening date of 04 January 2010 (delayed from rumours of 09/09/09 and 02 December 2009 opening dates), and final height of 828m (kept secret until opening day and slightly higher than the most common rumour of 818m). The tower's main claim to fame is that it is the tallest man-made structure in the world when completed, and in fact, the Burj Dubai attained that record before completion, in April 2008 when the height reached 629 meters. When completed, the top of the Burj Dubai was taller than the highest mountain peak (or hillock) of over 30 countries, including those lofty alpine nations of Belgium, Latvia, the Maldives, the Netherlands, and Uruguay, but not the UAE itself, which has a mountain top (Jebel Jais) in Ras Al Khaimah more than twice the height of the Burj Dubai. And to beat Mt Everest, you'd need to stack another 10 Burj Dubais on top of the first one. The final height of the Burj Dubai officially remained a secret during construction with the developer, Emaar, keeping schtum when asked. Various leakages resulted in most of the world speculating on 818 meters as the final height, although as the last bit is a spire being jacked up from the inside, it could make sense that more spire gets added and jacked up further to confound the statements of final height. Unless the jacker-upper gets distracted by an attractive bird flying past and the spire falls out. After an Emaar press release headline on 30 December 2008 said that the Burj Dubai was "over 780 meters and climbing ... ", several media sources in January 2009 said that the final height of 780m had been reached, while other sources said the Burj Dubai had topped out at a final height of 818m (and quoted inside information), and further sources said the tower was up to 780m or 818m and still rising. As with many reports in Dubai, trying to verify the accuracy of reported information can have the opposite effect and throw up more and more inconsistency (and no, we don't know the final height either). Burj Dubai Observation Deck - "At The Top"
See Burj Dubai Observation Deck information. 124th floor of the Burj Dubai devoted to 360 degree observation deck, with an outdoor deck area to please anyone with vertigo. Buy tickets at the Dubai Mall and get transported by travelator to the Burj Dubai for an elevator ride up to floor 124. Fancy telescopes showing daytime views at night, or night time views during the day, or historical views, or something like that. 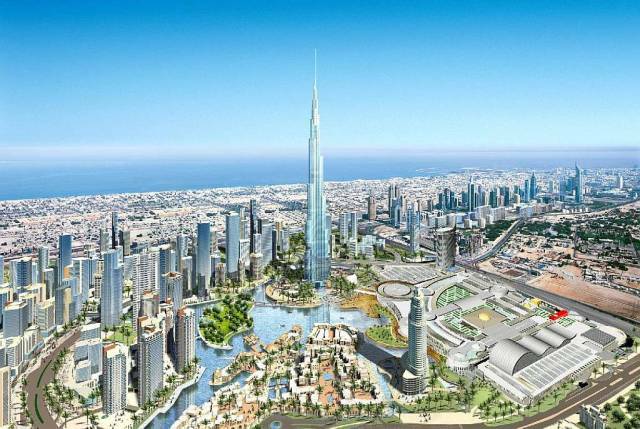 Interactive displays with show titles called "Burj Dubai Among the Greats", "Burj Your City ", "Dubai Then and Now", "Tallest Among the Tall"
At the foot of the Burj Dubai an 11 hectare park is planned, with grass, trees and water features. The garden is watered by condensate from the Burj Dubai tower cooling equipment, about 15 million gallons of water per year, or enough to fill 20 Olympic-sized swimming pools. First inhabitants of the Armani Residences in the Burj Khalifa started to move in. The 1 and 2 bedroom apartments are 100-200 sq meters in size and located on the 9th to 16th floors of the tower (press release 18 May 2010). The official opening ceremony for the Burj Dubai was held on the evening of 04 January 2010, where it was announced that the final height was 828m and the building had been renamed as the Burj Khalifa in honor of the President of the UAE, Sheikh Khalifa Al Nayan. Many people speculated that the renaming was also to say thank you to Abu Dhabi for lending $20 billion to Dubai to bail out Dubai World and other indebted Dubai Government owned companies. The Burj Dubai Metro Station also opened, although after the closing ceremony the crowds trying to get in effectively closed it for most people. The Burj Dubai station on the Dubai Metro might open at the same time as the Burj Dubai Tower on 04 January 2010 according to press reports this morning - "We are thinking about it but it is a complicated process to put just one extra station on the line," according to the RTA communication director, Peyman Younes Parham. The remaining Dubai Metro Red Line stations are expected to open by end of February 2010. Emaar announced that the last of the cranes on the Burj Dubai had been removed at the end of October 2009. Babu Sassi, the Indian crane operator who lived at the top of the Burj Dubai according to urban legend, also returned to base. When he arrived back on planet Earth, he said "All your base are belong to us" (AYBABTU). Update: An Arabtec press release 25 November 2009 about the removal of the cranes from the Burj Dubai, clarified that none of the crane operators was named Babu. Emaar Properties, the developer of the Burj Dubai, annouced that the planned opening date of the Burj Dubai would be 04 January 2010, to commemorate the accession of Sheikh Mohammad, the Ruler of Dubai, after his brother's death on 04 January 2006. Mohammad Ali Al Abar, the chairman of Emaar Properties, said "We have opted to officially open the tower on this date as a gesture of gratitude towards Sheikh Mohammed, who is the builder of modern Dubai," according to WAM, the official UAE news agency. The Burj Dubai opening date is "confirmed" as UAE National Day 02 December 2009 according to an Arabian Business report 09 October 2009, based on comments by the Chairman of Emaar, Mohammed Ali Al Abbar, who reportedly said to CNN that he was "shooting for UAE National Day". How "shooting for" translates into "confirmed" is not quite clear, and no official announcement from Emaar was seen. According to a report in Xpress, the chairman of Emaar Properties, Mohamed Ali AlAbbar said the Burj Dubai would open in December 2009 but didn't give an exact date. Mr Al Abbar reportedly said "We are very close ... It's December. We're not very far from the opening." The press release about the Burj Dubai observation deck experience, called At The Top, said at the end that "At The Top is scheduled to open this year" but didn't give an exact date. At least we know it will be before the end of 2009 now ... unless it's delayed. An Israeli publication, Ma'ariv, carried a report that Dubai Police had arrested a large number of people that were planning to bomb or fly a plane into the Burj Dubai, allegedly with the plane based in Iran ready for attack. Maariv is in Hebrew, but an English language publication from Israel, Ynet, said "Officials connected to the case reported to Ynet that some of the detainees said in the investigation that they plotted to crash a plane into the Burj Dubai." The Dubai Police denied the report, with Acting Chief of Dubai Police, Major-General Khamis Mattar Al Mazeina, telling the Gulf News that "The news is completely incorrect and far from reality. ... We also did not bust any criminal network or any person with explosives in Burj Dubai or any other place in Dubai,"
Arabian Business (AB) says that the Burj Dubai opening date will "officially" be 02 December 2009, to coincide with UAE National Day. Their official source for the information is a "senior architect" working on the Burj Dubai project but a name was not given. AB also says that the Burj Armani Hotel will take its first guests on the same day. Back in December 2007, Arabian Business said that the Burj Dubai would open before December 2008 and U2 would play at a Burj Dubai New Year's Eve party on 31 December 2008 (it wasn't, and they didn't). Subsequent enquiries by other publications attempting to clarify the source and new opening date received a response from Emaar saying that the Burj Dubai would "open this year as scheduled", without being told what the scheduled opening date is. 12 July 2009 - Burj Dubai opening date December 2009? Somebody from Emaar was reported by The National as saying "We never confirmed this date, it will open at the end of the year," in reference to a possible September 2009 opening date, implying that December 2009 will be the opening date for the Burj Dubai, and contradicting what the Emaar press release in June 2008 said - "completion in September 2009". To look at the building, it seems plausible (September 2009 doesn't), but as with many large projects in Dubai, official opening dates are often rescheduled multiple times. The Architect's Journal (a UK publication) in June 2009 speculated that the final height could be as much as 890.7 meters, based on comments from an engineer with the architect of the Burj Dubai tower, who said to add together the heights of the Empire State Building and the Sear's Tower. The journal couldn't make up their minds whether to include antennas or not in their calculation (usually antennas are not included in final height measurements) and confusingly proceeded to include the Empire State Building antenna but not the Sear's Tower antenna, thus coming up with a number that shows they belong on the same bus as Germaine Greer when it comes to stating facts and figures about Dubai. Doing the calculation without antennas results in a final height estimate of 823m, which is close enough to the oft-reported 818m figure. "The project is expected to open by the end of the year," - implying that a previously indicated September 2009 opening date was unlikely. "After lowering all the cranes in August, we still have to finish all the fitouts." - we assume he means August 2009, not 2010. "Yes, it is possible to jack up the spire from the inside of the building." - but no further comment on the final height, which didn't stop newspaper headlines speculating that the final height might be more than 818m, might be 888m, might be ... pick a number. That the Burj Dubai was "entirely empty". She was apparently not aware of a common safety requirement for buildings under construction, which is that residents must wait until it is finished before moving in. "the Empty Quarter stretching away to the south" behind the Burj Dubai. The Empty Quarter, or Rub Al Khali, is a vast expanse of desert that starts between Abu Dhabi and Saudi Arabia, and includes parts of Oman, Saudi Arabia, and Yemen. Even from the top of the double decker bus on which she was travelling, Ms Greer would be lucky to see a desert that is not even marked on any map of Dubai that we know of. To top it off, so to speak, Ms Greer complains in the headline of her article that Dubai's architecture is "crass", but then goes on to refer to the Burj Dubai as a "needle stuck in the buttock of the Almighty", a comment which most would find at least crass, if not insulting and disrespectful. It's possible that Ms Greer has a relatively low level of intelligence and awareness based on some of her incorrect observations about Dubai, but nevertheless, it seems unlikely that she is so ignorant that she doesn't know how offensive such a comment might be to residents and citizens of the UAE, which means it was probably deliberately worded by her to cause offence. Something many people would regard as a rather "crass" thing to do. What color is the kettle, Ms Pot? Emirates Business, a Dubai newspaper, reported that insider industry sources had told them the Burj Dubai was going for a soft opening on 09 September 2009 (09/09/09), the same date as the Dubai Metro is scheduled to start operating. Emaar, the developer, didn't comment. The accuracy of UAE press reports from "a source that did not want to be named" or from "a person close to the matter" often turns out to be substantially less than 100%. And it seems odd that Dubai would want to open two mega projects on the same day, thus diluting the publicity for both of them. Based on uneducated and unscientific observation of the outside of the building, a late 2009 opening date seems realistic. The next day (18 January 2009), the same newspaper reported that the Dubai Armani Hotel was expected to open by the end of 2009, according to "a source." Obviously U2 didn't turn up, and there was no party anyway as the Burj Dubai was still under construction. Final height is still a secret but the number of sources giving 818 meters as the top, is increasing. Emaar issued a press release 30 December 2008 saying the height was 780 meters (2,559 ft) and had over 160 floors. Emaar also said the tower was "On course to open in 2009" but didn't give a specific date. A press release from Emaar Properties said the Burj Dubai "will be taller than previously envisaged, with height enhancement work already in progress" but didn't say how much taller. Burj Dubai height was given as 636 metres (2,063.6 ft) and 160 levels but final height wouldn't be revealed until the building is completed. The Chairman of Emaar, Mohamed Ali Alabbar, said in the press release "We believe that a completion date of September 2009 is possible and reasonable for a project of this global magnitude and significance." which sort of agrees with the headline and first paragraph that said "completion in September 2009". Emaar Properties announced that the Burj Dubai had reached a height of 629m (2064 ft), just ahead of the KVLY TV mast (623m, 2063 ft) in North Dakota in the USA, which had previously held the tallest structure record. 31 December 2007 - U2 to perform at Burj Dubai party 2008 New Year's Eve? Earlier in 2007, Emaar announced plans to hold a New Year's Eve party in the Burj Dubai on 31 December 2008 to celebrate the completion of the building - expected to open before Christmas 2008. Arabian Business, a UAE business magazine, carried a brief story that U2, an Irish rock band, were rumoured to be booked to play at the party. As Emaar developments seem to be fairly strict on no-alcohol policies (Dubai Marina restaurants are apparently still waiting for alcohol licenses they expected to have when first opened), it would seem an unlikely mix. Irish rock band and no beer? Especially for a New Year's Eve party? The Burj Dubai construction is up to 150 storeys and reaches a height of 555 metres, just ahead of the CN Tower in Toronto, Canada at 553 metres which had been the tallest free-standing man-made structure in the world since 1976. 22 August 2007 - 1300 dhs for a tour of the Burj Dubai? 7 Days, a Dubai newspaper, reported that someone called Tunafish was advertising, on dealbay.ae, VIP tours to the top of the Burj Dubai for 1300 dhs per person (US$354), by dressing customers up as construction workers. S/he claimed they had permission from Emaar Properties to do the tours. Emaar Properties were not amused and said that was incorrect. The Burj Dubai overtakes the Taipei 101 to become the tallest occupied building in the world at 512 meters, with 141 floors. There are a couple of unoccupied structures taller than the Burj Dubai - the 553 meter CN tower in Canada, and the 629 meter KVLY/KTHI television mast in Blanchard, North Dakota, USA (which is not free-standing). Another milestone is achieved as the Middle East reclaims the title of tallest building in the world. It was previously held by the Great Pyramid of Giza in Egypt until 1889, when the Eiffel Tower in Paris took over the title. Burj Dubai height now up to 468 m and has 130 floors. The highest occupied building in the world is the Taipei 101 at 509 meters. The Burj Dubai reaches 422.5 metres and 120 floors, setting a world record for the most number of floors in a building. The Burj Dubai is up to 380 metres and 110 floors making it the tallest building in the Middle East and Europe, and equal with the Chicago Sears Tower with the most number of floors in a building worldwide. There were reports that the completion of the Burj Dubai would be delayed up to a year due to the bankruptcy of the cladding company, Schmidlin (see 22 February 2006 below), but Emaar Properties, the developer, said that they were only a couple of months behind schedule and expected to catch up so as to open on schedule at the end of 2008. They had appointed a new cladding supplier - the Far East Aluminium Works Company in China - and installation would be done in partnership with the Arabian Aluminium Company starting June 2007. The Burj Dubai becomes one of only 6 buildings worldwide that have more than 100 floors. Height of the Burj Dubai is almost 350m. The Burj Dubai becomes the second highest building in the UAE as it reaches 95 levels and a height of 329 meters - taller than the Burj Al Arab at 321 metres but less than the Emirates Towers office tower at 355 metres (which is the tallest UAE building). 81 floors or storeys completed - about half the total expected height. Current progress is a floor completed every three days. "Construction Weekly" (a UAE based weekly newspaper) said that as cladding work had not yet started, there could be delays to completion deadline of December 2008. Schmidlin Ltd. Facade Technology, a Swiss company, was supposed to supply the exterior cladding for the Burj Dubai, but filed for bankruptcy. The Burj Dubai area will have a metro station on the Red Line, which is scheduled to open in September 2009. The Burj Dubai construction, will be the tallest tower in the world when completed, with a hotel, shopping, and residential accommodation all incorporated inside. But it is part of a much larger project which involves shifting the center of Dubai from wherever it is (no one really seems to know) to the Downtown Dubai development which will include the Burj Dubai, and have Business Bay (another large development) nearby. Architect is Adrian Smith, a partner with Skidmore, Owings and Merrill, who has been involved in the design of several other tall buildings around the world. 'Burj' is Arabic for 'tower'. 'Dubai' is Arabic for 'mind bogglingly tall'. Or might as well be. Total number of floors will be 160. A private elevator will travel from the ground to the 136th floor, a vertical trip of 504 meters, the longest of its type in the world. The Burj Dubai design was inspired by the Hymenocallis - a desert flower seen throughout the region. The Burj Dubai also incorporates elements of Islamic design. At least that's the official story. An unofficial story is that the design was based on the cancelled Grollo Tower tower which had been proposed for construction in Melbourne, Australia. Excavation work began in January 2004, the Burj Dubai was originally expected to be completed by December 2008. Samsung Corporation of South Korea awarded building contract in December 2004, value AED 3.3 billion. As of June 2006, value is quoted as AED 3.7 billion. Other contractors involved are Besix and Arabtec, and Al Naboodah for labour supply. Project and Construction Manager is Turner International. Burj Dubai construction site is the largest in the world and will have over 20,000 slav ... ahem ... construction workers although actual number at any one time may be much less than that, about 3000-8000 usually. In March 2006, rioting workers started to reverse the construction process by damaging cars and offices on the site in protest at their low wages and poor treatment. Value of damage caused was estimated to be about AED 3.7 million (roughly the amount needed to pay all Burj Dubai laborer salaries for a month). Footprint of 8000 square meters, concrete is 3.7 m thick with 192 piles sunk to a depth of 50 m.
50 levels reached on 20 June 2006 with one level finished about every four days. When completed, the New York based Council on Tall Buildings and Urban Habitats will award the Burj Dubai the record in all four categories the CTBUH recognises – highest structure, roof, antenna and occupied floor. The Boulevard - main road through the development (or might be called Burj Dubai Boulevard now). Burj Dubai Lake Hotel - luxury hotel apartments (available for individual purchase). The Dubai Mall - the largest shopping mall in the world when it opened in November 2008 (originally scheduled to open in November 2006). The Old Town - low rise apartment and villa residential area. The Parks - Burj Dubai version of Central Park or Wimbledon Common (but with more sand). The Residences - nine residential towers in the Burj Dubai area. An observatory is planned for the 124th floor and it won't take long to get there since the Burj Dubai will have the world's fastest elevator - at a speed of about 60 kph. Giorgio Armani is designing a 172-room hotel to be lost inside the Burj Dubai somewhere - with the unexpected name of The Armani Hotel. Burj Dubai artwork includes World Voices art display by Jaume Plensa, with 196 symbols to represent the 196 countries of the world. The Burj Dubai won't be the tallest tower forever though. Already Nakheel has announced an 800-900 m tower (the Al Burj) to be built in the Dubai Waterfront project (although it will be a long time coming, especially with a 12 month delay on the start of construction announced in January 2009). And in 2006 Kuwait annouced a tower that just creaks over a kilometer in height, at 1001m, to be built as part of their Madinat Al Hareer (City of Silk) development. Construction start date January 2004. Burj Dubai official opening date 04 January 2010. Total amount of concrete 330,000 cubic meters (11.5 million cubic feet). Total steel rebar used 39,000 metric tons. Total amount of glass 142,000 square meters (1.5 million square feet) - about the same area as a medium sized shopping mall in Dubai. Total man-hours of labour 22 million. Total of 57 elevators including the fastest in the world with a speed of over 60kph (40 mph), and the longest in the world with a vertical distance of 500 meters for the service elevator. Burj Al Arab - was the tallest hotel in Dubai when built, overtaken by the Mariott a few years later. Burj Dubai by numbers - list of some numbers about the Burj Dubai. Dubai Armani Hotel - in the Burj Dubai. Dubai Fountain - an AED 800 million sprinkler system at the foot of the Burj Dubai. Dubai Mall - largest shopping center in the UAE, Middle East, or somewhere. So of course it's next to the Burj Dubai. Germaine does Dubai - in 4 hours, and rips into Dubai and the Burj Dubai, so it seemed only fair to rip into her. Hotels in Dubai - somewhere else to stay if rooms are full at the Burj Dubai Armani Hotel. www.burjkhalifa.ae - official Burj Khalifa website. Domain www.burjdubai.com (old Burj Dubai website) forwards to burjkhalifa.ae. Domain www.burjkhalifa.com is not the official website (as of January 2010 at least). www.burj-dubai-tower.org - a commonly seen Burj Dubai website but they seem to have got it mixed up with the Burj Al Arab hotel, at least that's what the first photo on their home page is of. www.dubaifaqs.com/burj-dubai.php (PDF and print version).